There is a small chain of pizza/stromboli stores in Columbus called Pizzano's. It’s not the best pizza in the world, but it’s decent and quick. We get it at our office and Miss Sally likes their cheese/black olive/banana pepper stromboli. On President’s Day, we tried to order some Pizzano’s for the office. Their phone rang and rang, but no one answered. We assumed they were closed for the holiday and we ate Lori’s stash of chocolate for lunch instead. Last night, I tired to order some for dinner. Again, the phone rang and rang. Pizzano’s web site was up, but their outsourced, online ordering system said CLOSED. Oh dear. I ordered Donatos and drove over to pick it up. 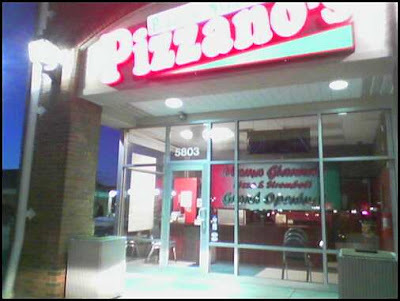 Being a curious little boy, I drove by Pizzano’s to see if their building was open. I remembered on the way over that Pizzano’s was in the middle of a name change or take over by Mama Ghambi’s Pizza and Stromboli. They had big “Grand Opening” signs in their front window from our previous successful visit. Maybe they had just changed their number. 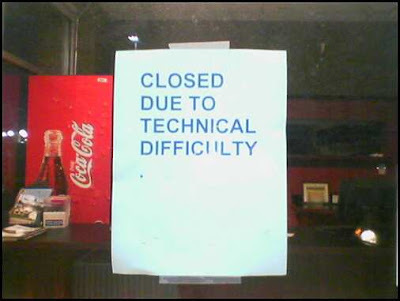 I’m not sure how a Pizza place can have a technical difficulty, but it seems they somehow do or did. I hope everything works out for them. I grow weary of chocolate for lunch.